With the spring thaw comes new plant life, warmer weather and insects. Wasps and other stinging bugs can become a real nuisance for some homeowners, and can be even more dangerous for those with allergies to wasp stings. Wasp sprays can often do more than just eliminate single wasps. A wide range of companies release wasp spray meant to combat these aggressive insects, though each spray can have a variety of uses. The primary purpose of wasp spray is, of course, to eliminate wasps. This often means spraying lone wasps directly, saturating them with compounds found within most of these sprays that attack the nervous system of wasps. Death is not always instantaneous, so consumers should stand a safe distance from the wasp in question (most sprays have a reach of up to 20 feet) before using the wasp spray in this traditional way. Wasp spray also kills hornets and yellowjackets. Besides just killing individual wasps, many sprays can also effectively be used to destroy entire nests. For this application, users should wait until early morning or late night, as this is when wasps are least active. Standing safely away from and downwind of the nest, users should spray the nest until it is completely saturated to ensure that the entire nest population is destroyed. 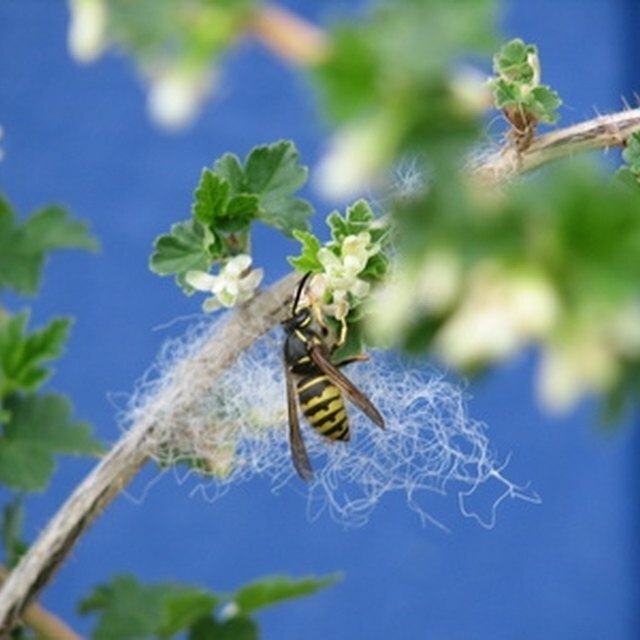 Users should take caution, however, since some wasp sprays may be more effective at eliminating nests than others. Additionally, users should never try to use a commercial wasp spray to eliminate hornet nests or underground wasps nests. Only professional pest controllers have the knowledge and equipment needed to take down these somewhat more dangerous nests. Many wasp sprays are effective not only with stinging insects like hornets, yellowjackets and wasps; many can also be used to kill other kinds of dangerous insects like fire ants, brown recluse and black widow spiders, killer bees, scorpions and mosquitoes. Additionally, non-dangerous pests like roaches, millipedes, moths and waterbugs can all be eliminated using most wasp sprays. Some people even suggest using wasp spray on people as a form of self-defense. Wasp spray acts almost like pepper spray, causing the eyes to burn and the throat to constrict when sprayed in an assailant's face. Still, because wasp spray is not approved for use on human beings, there is a possibility that it might do lasting damage. Many jurisdictions prohibit its use entirely, even in self-defense situations. What Do You Do to Wooden Steps That Won't Quit Oozing or Bleeding Sap?